Want to increase the reach and life of your Instagram content? Simplify your workflow by seamlessly cross-posting your Instagram content to Pinterest! Note: Amplify with Pinterest only works with Instagram content that is posted using the Auto Post method. When scheduling a Post to Instagram with Tailwind using Auto Post, click the Amplify with Pinterest! checkbox. This will Pin the image to Pinterest when the Instagram image is posted. 2. Choose the board that you want to Pin your Instagram Post to. 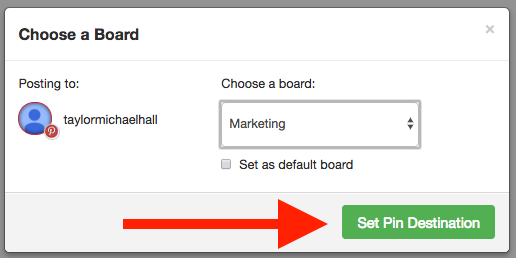 You can also set this board to be your default board for all future Amplify with Pinterest Pins. 3. Click Set Pin Destination to save your board choice. 4. If you wish to change the board that your content will be pinned to, click the Pencil on the right side. That's it! Now your image will also be Pinned to your Pinterest Board when the Instagram image is Posted! You must have your Pinterest Profile and Instagram Profile connected to the same Tailwind Account in order to cross-post. Amplify with Pinterest is only available when using the Auto Post method of scheduling to Instagram.